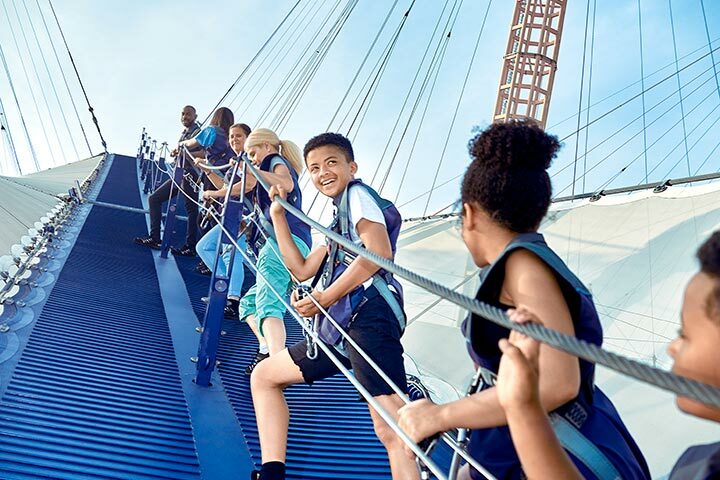 Up at The O2 is an exhilarating 90 minute experience that takes you on a guided expedition over the roof of The O2 via a fabric walkway. 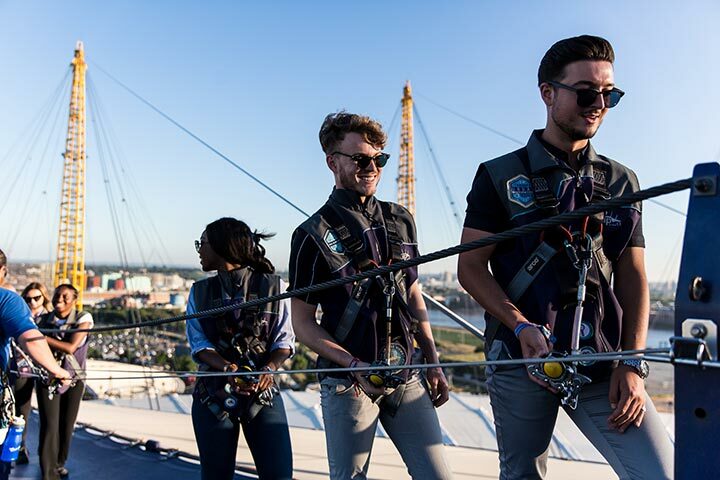 Suspended 2m above the surface of The O2 roof, the walkway is 52m above ground level and 380m long. At its steepest point the walkway has an incline of 28° on the way up and 30° on the way back down and has a slight bounce to it to mirror the surface of the tent. Before you climb, you'll meet your Climb Guide who'll take you through everything you need to know and give you a climb suit, shoes and a safety harness. At the summit, there is an observation platform where you can take in spectacular views of London. Just minutes away, sit down to a tasty three-course meal with a drink at Cabana, a brand new lively and colourful chain restaurant serving a selection of snacky Brazilian-style street food. Your meal will typically include three courses from a set menu and a glass of wine, beer or soft drink. Please see the sample menu below, please note menus are subject to change throughout the year. This experience is available on weekend dates, throughout the year. The minimum age is 10 years old, alcohol will be replaced with a soft drink for those under 18. The minimum height is 1.2m (3ft 9") and the maximum weight is 130kg (21st). Maximum waist measurement is 125cm and maximum upper thigh measurement is 75cm. Up at The O2 is not suitable for pregnant customers. Climbers must not be under the influence of alcohol or legal or illegal substances, you will not be permitted to participate and will not be refunded. For all bookings for two people under 18 years old, there needs to be at least one climber over 18. We really enjoyed the climb at the 02, to my surprise the material we were walking on was rubbery and it felt like we were walking on a giant trampoline, I had to ignore the child in me and follow the safety procedures and not have a little bounce! It was certainly very exciting arriving at the top of the 02, to be standing on top of an iconic London landmark which has hosted some of the world’s most talented artists! The views were fantastic that day and we had a 360 degree unobstructed view of London! Got the chance to do it before a Michael McIntyre show and enjoyed it but the weather was terrible. 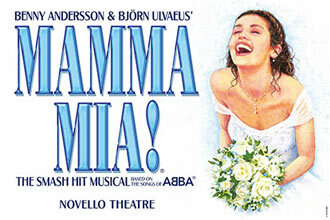 Would like to revisit in the summer to see if it is a better experience. 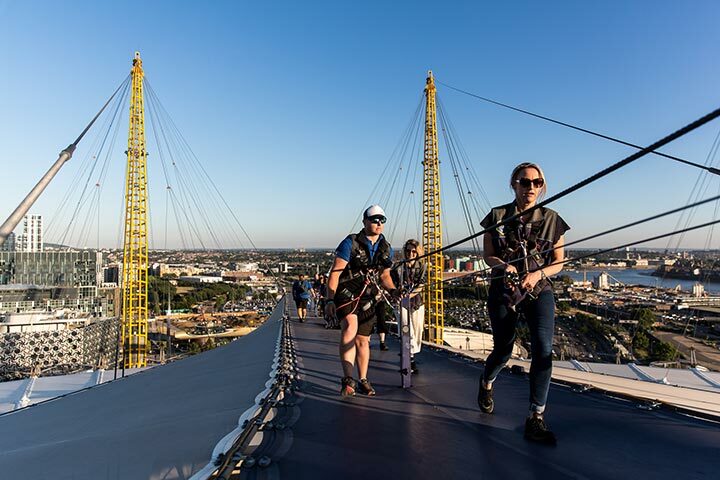 We really enjoyed the climb at the 02, to my surprise the material we were walking on was rubbery and it felt like we were walking on a giant trampoline, I had to ignore the child in me and follow the safety procedures and not have a little bounce! It was certainly very exciting arriving at the top of the 02, to be standing on top of an iconic London landmark which has hosted some of the world’s most talented artists! The views were fantastic that day and we had a 360 degree unobstructed view of London! The meal at Cabana restaurant was very tasty! I had never eaten Brazilian food before and being vegetarian I was concerned I wouldn’t have much choice but I was wrong! To start I had cheesy dough balls made with cassava flour and I discovered this is the national snack of Brazil! For by main meal I had a coconut cauliflower curry, I was not sure that this would be something I would like however it was delicious! As for dessert I treated myself and I had churros with caramel sauce. The menu was great and I certainly will be going back to Cabana! Unless you are climbing the O2 in the summer I recommend bringing gloves and a hat as it can be very windy up there!